Until and unless you have been hiding under a rock, odds are that you have heard about the fascinating world of IoT and the transformational impact it is going to have on our lives. As more and more consumer companies realize the benefit too, and start offering their connected products & services, they will more often than not have to tackle the question of the optimized retail & channel strategy for an IoT product. Ten years from now, it might not be a relevant question as the underlying premise would be that all devices would be “smart” or “connected”. Quite like a few years back it was common to refer to a mobile device with applications and advanced data features as a “smartphone” -which now has been replaced by just a “phone” as we expect them to be inherently smart. Similarly all consumer electronic devices, homes & cars would be smart & connected- but until utopia is reached, let’s analyse what companies are currently doing to sell these devices through the retail channel…. and what’s working and what’s not. Every product has unique marketing and channel needs based on its evolutionary phase on the technological lifecycle. Looking at where consumer IoT stands today, what really is needed is an effective way to humanize the story or bring it to life through tangible real retail experiences. Consumers need to see them, touch them and have a compelling desire to own one these fascinating (sometimes overpriced) devices. We need to collectively find a way to help make the leap from B2G (Business to Geek) to a real B2C story and not just having an endless aisle of products with no one to discuss them with! To better understand how these connected products were being promoted I went mystery shopping on one of my trips to SFO. There was a lot of chatter around Best Buy, Sears & Targets’ concentrated efforts in this space and hence I visited them to make a mental note of the best in class approach. Best Buy has singled out IoT and the Apple watch as the 2 drivers for its success this year. By their own admission, the combination of these two helped fuel consumer demand and resulted in the firm posting expectation-busting numbers last month, which increased the share price by 14%. Full marks to them for giving the “connected category” prime real estate and investing in customer experience. The store I visited, much to my delight, had the “connected section” right at the front of the store but what made the experience so much more meaningful was the fact that they had miniature rooms created which helped visualize the product experience and the art of the possible. The store rep was informative (but not insightful) and looked a little bit out of his depth, although he did a good job with up to date infn on most of the products. To be honest, the connected ecosystem is quite confusing. The market is overcrowded, products are sold piece meal and there are a plethora of choices on technology- with no clear winner. A lot of people find out the hard way, including yours truly, that they have invested $400-500 in a proprietary technology or a hub which has limited to no interoperability with other expensive goodies. Where companies could help a lot more is through specialist reps who understand the ecosystem extremely well and can recommend products meeting the customer’s unique needs. That’s where Sears has hit the ball out of the park! 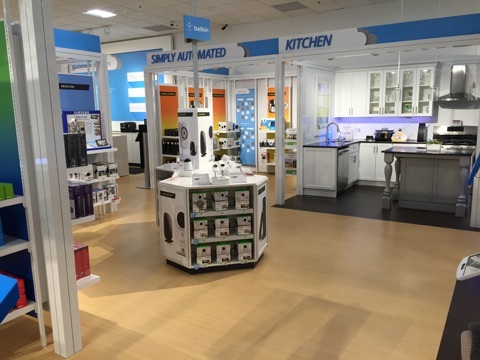 I had the opportunity to visit their much hyped San Bruno flagship store, which essentially has 4,000 Sq Ft dedicated section to the connected consumer experience. As the pictures and this virtual video illustrates they have actually got real estate dedicated to each room of the house with live use cases and products being highlighted. 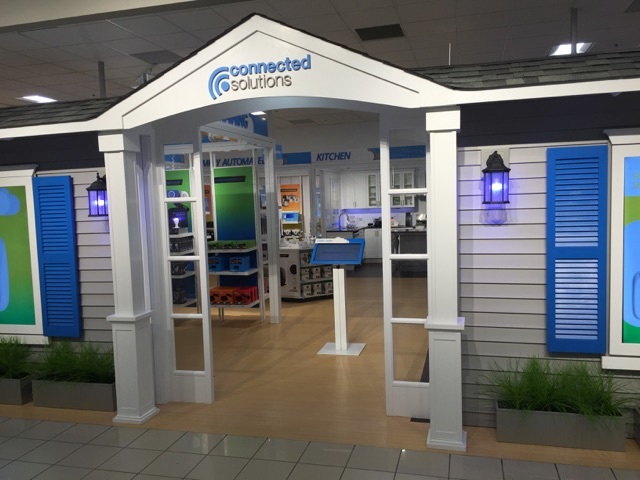 In a way Sears is forcing customers to explore, learn and interact with connected products and see them working in the context of the home. To top it up the customer rep I interacted with clearly understood the complexities of the products showcased – he was extremely helpful and actually suggested alternatives to setup my home automation system with the best in breed (compatible) products at the least cost! Truly a memorable experience! 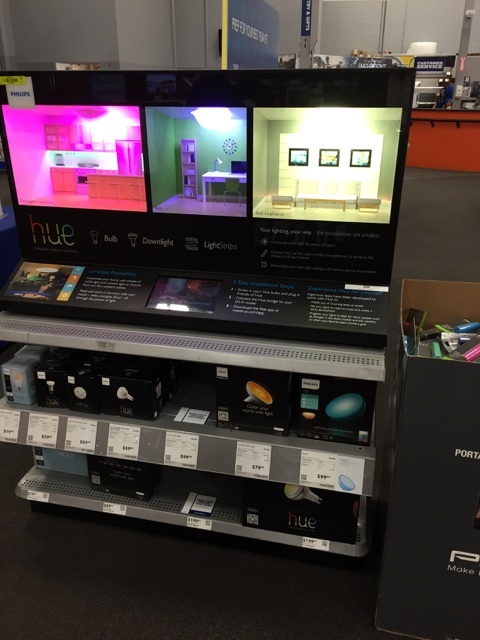 Hoping to see more wide scale rollout of similar “experience centers” from other retailers. Unfortunately, I wasn’t able to visit Target’s experimental store called “Open House” where not only are they experimenting with some of the most advanced Consumer IoT devices but also new ways of retailing in general. From what I read, they seem to be focussed on helping customers discover new products, getting them to understand what their own unique needs are and also in capturing feedback to optimize the experience! The target store I visited really dint have much to write home about as some of the reps didn’t know if they had a “connected section”, to begin with. Waiting on David Newman to have a wider rollout of the connected store experience. In a nutshell, the increasing complexity and interoperability challenges for IoT products are making the Sears/Apples’/Best Buy’s operating model increasingly relevant as customers want and need more help selecting, installing, connecting, integrating, using, maintaining and taking full advantage of their products. These companies have already invested heavily in the real estate and now need to make Customer’s physical experience and education around IoT front & centre of their strategy to ensure they can get back into the game and compete long term with the Amazon’s of the world. Based on what I just witnessed it seems to be game on! ← The Deluge of Wearable Devices!